Carolina Nitsch is pleased to present Hours of the Day, 2006, an installation by Louise Bourgeois. This exhibition inaugurates Carolina Nitsch Project Room, the gallery’s new additional space devoted to special projects and located in Chelsea. Themes of time and memory have been a consistent presence in the work of Louise Bourgeois, though her forms and materials have varied over the past seven decades; as she once stated ‘I travel in time, not in space’. Hours of the Day is a continuation of Bourgeois’ engagement with the passage of time. 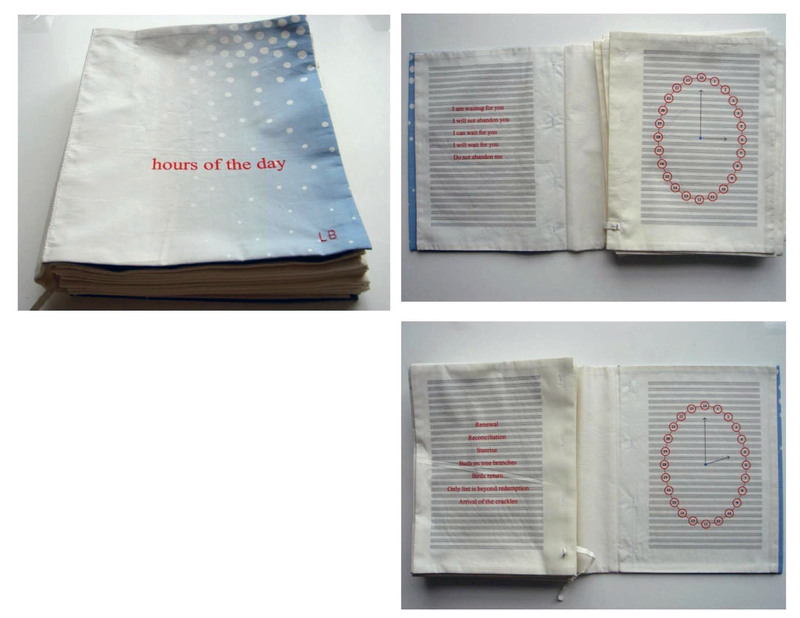 The installation comprises a series of printed individual fabric diptychs – and a fabric book - in which Bourgeois juxtaposes each hour with text written by her. Being a chronic sufferer of insomnia, Bourgeois is acutely aware of her sensations and surroundings, these only magnified during the long, lonely hours of the night. The passing of time, her memories, the qualities of changing light and ambient sounds are registered in Hours of the Day coupled with her captivating words. The recall of memories is inherently conflicted for Bourgeois – the fear of losing her memories – as well as her desire to forget painful experiences to achieve a place of peace. As Deborah Wye, Chief Curator of the Department of Prints and Illustrated Books at The Museum of Modern Art has aptly recognized, printmaking for Bourgeois, unlike most artists, has always been an important and intimate experience, indeed ‘this medium has bracketed her artistic life - she depended on printmaking in her earliest years and does so again now, in old age. 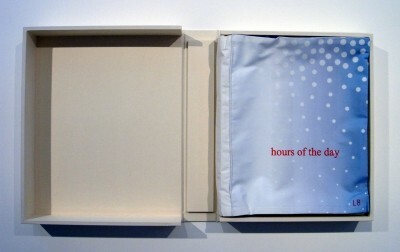 Carolina Nitsch and Lison Edition, New York published Hours of the Day in 2006. The project was conceived as a 25 cloth panel installation in an edition of 7 (each 17-1/2 x 27”), as well as a cloth book in an edition of 15 (14-3/4 x 12 x 2-3/4”), both of which will be on view. Louise Bourgeois was born in Paris in 1911. Initially studying advanced mathematics at the Sorbonne, Bourgeois later studied art at the Ecole du Louvre. After marrying the American art historian Robert Goldwater she moved to New York in 1938 where she has lived since. In addition to traditional materials Bourgeois has continued to explore her emotions and memories through a wide range of forms and materials, from latex, rubber, cloth, steel, found objects, with printmaking being an integral medium in her artistic practice along with sculpture. Bourgeois’ first major work was the set of etchings He Disappeared into Complete Silence (1947). She published this suite at the same time that she created the ‘personage’ sculptures for her solo exhibition at the Peridot Gallery, New York. (1949). These figures were conceived as an environmental installation; with the personage Sleeping Figure, 1947-49 later being acquired for The Museum of Modern Art’s collection by Alfred J. Barr Jr., the museum’s first director. At age 71 Bourgeois was the first woman to be accorded a retrospective at The Museum of Modern Art. On the occasion of Bourgeois’ 90th birthday, an exhibition of her work was held in 2001 at the State Hermitage Museum, St. Petersburg in Russia. A retrospective of Bourgeois’ work is currently showing at the Tate Modern, London. This exhibition will travel in 2008 to The Centre Pompidou, Paris, the Solomon R. Guggenheim Museum, New York, the Museum of Contemporary Art, Los Angeles, and in 2009 to the Hirshhorn Museum & Sculpture Garden, Washington, DC.